The outstanding Villa Magna luxury condominium building is located right on the sandy shores of Highland Beach, Florida. You’ll always feel like you’re in paradise when living in a Villa Magna condo. Step into the magnificent lobby, and be whisked away to any one of the 89 private residences. The building is manned with security and a doorman 24 hours away for your safety. Inside the residences, you will be amazed by the upgrades made to these homes. They come with features like large chef’ kitchens, floor to ceiling windows, crown molding, spacious floor plans, oversized master bedrooms, marble floors, and breathtaking views of the Atlantic Ocean that cannot be compared. 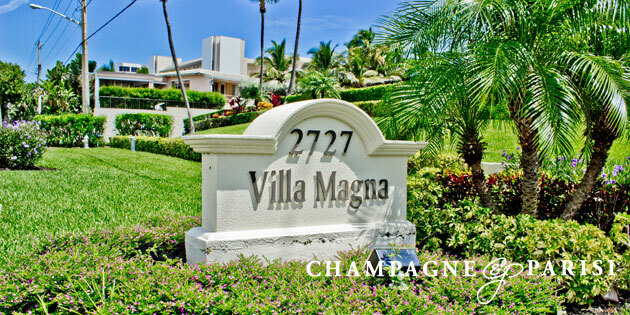 5-star amenities are included when purchasing a condo for sale in Villa Magna Highland Beach. Residents are just steps away from lounging on a private beach, or can stay home and relax by a glorious swimming pool complete with a comfortable chairs and cabanas. Residents also get access to a fitness center, storage room, wine room, covered parking, and clubroom fit for entertaining. You’ll also never be far from the city activity.